Whether you’re traveling abroad and wanting to stay in touch with loved ones back home or just trying to cut back on your mobile phone usage, knowing how to call someone from your laptop is definitely a good thing – and even better if it’s free. If you live in the U.S. there’s a hands-down winner for making free calls to friends and family: Google Voice allows you to make unlimited free calls to any number in the U.S. or Canada – at least until the end of 2011, though I suspect it will remain free forever knowing Google. Not only does Google Voice allow you to make free calls, but it also provides you with a free virtual phone number in the area code of your choice. People can then call this virtual number and, at your choosing, Google Voice will forward the call to your U.S. landline, mobile phone or even directly to your Gmail. This last option allows you to receive phone calls anywhere in the world on your laptop as long as it’s connected to the internet (note that this requires the Google Talk browser plugin). 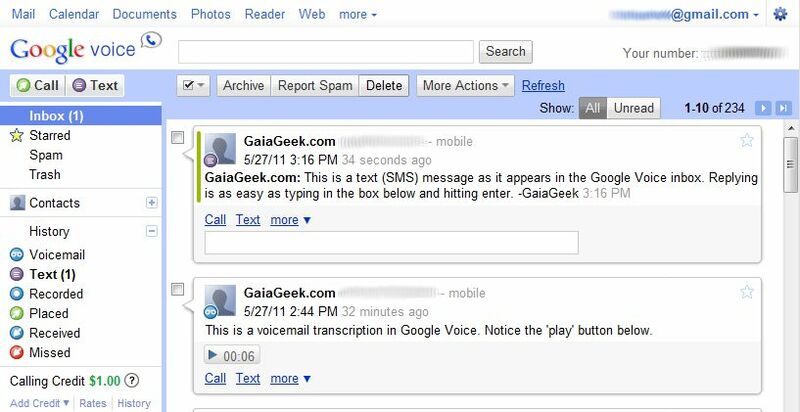 Similarly, you can call people directly from your Gmail page by clicking the “Call phone” link in your chat list, and when you make such calls the person receiving the call will see your chosen Google Voice virtual phone number as the number calling, allowing them to know it’s you. This is a very important difference from many other internet calling solutions (free or otherwise) because with many of them, the call comes up as “unknown” or as some strange number, leaving the call recipient wondering whether it’s a telemarketer or someone else they don’t want to talk to. Above: A view of the Google Voice inbox. In addition to making free calls, you can send and receive free text messages (SMS) with Google Voice to anyone in the U.S. and Canada. If you’re someone who spends much of their day in front of a computer, this can be a Godsend since it’s much easier to type out a message on a computer keyboard than it is to type a message on your phone. EvaPhone – Calls are extremely limited in length, i.e. under 2 minutes to landlines and as little as 15 seconds for mobile phones. Freebuzzer – Requires that the service call you on your phone number. Calls are limited to 2 minutes. Tuitalk – No free calling to mobile phones in most countries. Allowed calls are limited to anywhere from 2 to 6 minutes. It’s important to note that these are examples at the time of writing, and that these services can often disappear overnight – so don’t be surprised if you click one of these links and find that the company no longer exists, or is no longer offering free calling. Free phone calling, especially to mobiles phones in foreign countries, tend to attract a lot of people who abuse the system, and such abuse can quickly put the service provider out of business, or at least force them to stop providing the free service. Such services may serve your needs if you just need to call someone to speak briefly. However, if you continue to use any of these services regularly, you’ll probably become frustrated with the limitation and/or the quality of the service (imagine how many people in the world are trying to make free phone calls using these services). Eventually you’ll consider paying for service – which is exactly what they’re hoping for. Rather than fall for this, I suggest finding a decent paid service that meets your needs based on the countries you call most. You can use this webpage to see a current comparison of different calling rates to different countries with a variety of service providers, including both landlines and mobile phones in that country. (You’ll notice the word “voip” in the names of many of these companies, which stands for “voice over IP” – the technology being used when making calls over the internet.) I’ve paid for service with a number of these providers over the past few years and have found that the service is acceptable (don’t expect much, if anything, in terms of customer service or tech support) and the rates tend to be the best available, often even cheaper than calling the same number from a mobile phone within that country. Find the country you call the most, be sure to distinguish between the rate for calling landlines and the separate rate for mobiles phones, then see which provider offers the lowest rate. Note that in some cases a connection charge applies for each call, so don’t assume that the lowest published rate will translate into the cheapest call, especially if you make a lot of calls lasting only 1 or 2 minutes. Since this article is about “free” online calls, note that when you buy credit with many of these services, you often get 90 or 120 “freedays” during which you can call many destinations for free. Note that these freeday promotions also have their limit, and after you make so many calls for free, you’ll be notified that you reached your limit and have to pay the standard rate, so it’s usually better to just find which provider has the cheapest standard rate instead of which one offers free calls. If you know of a service which has outstanding rates (better than any listed on the comparison page above) or if you know of a new service offering free calling to countries other than the U.S., please share your knowledge by posting a reply below.